Prime Minister Shri Narendra Modi’s recent visit to Iran marks a new beginning in bilateral relations and beyond. The government deserves praise for the manner in which various pieces of this were put in place. The ground was prepared by extensive interaction of key Ministries — External Affairs, Transport, Finance and Petroleum — with their Iranian counterparts to overcome persistent hurdles and ensure synergies. In consequence, we have a set of interlinked outcomes: a contract for the development and operation for 10 years of two terminals and five berths; the extension of credit lines of $500 million for the port and of Rs.3,000 crore for importing steel rails and implementation of the port; and more. Indian Prime Minister Narendra Modiji concluded a two-day visit to Iran by signing a raft of agreements, including two key deals that will likely enable him to circumvent contentious neighbour and regional rival Pakistan — thereby establishing a crucial economic and strategic pathway toward the rest of the world. The most noteworthy of the 12 agreements signed between Modi and Iranian President Hassan Rouhani is India’s investment of $500 million into developing Iran’s Chabahar port, considered an important entrepôt leading to Afghanistan and onward to Central Asia. Afghan President Ashraf Ghani also later joined the two leaders to sign a trilateral transit agreement that will significantly ease the passage of goods between the three countries and boost trade. India has confirmed it will invest $500 million to develop the Chabahar port in Iran. Chabahar Port is a seaport in southeastern Iran, lying in the Gulf of Oman. It is the only Iranian port with direct access to the ocean. Chabahar is 700 km away from Zahedan, the capital of the Sistan and Baluchistan province. The marine distance to Dubai is 353 nautical miles (nm), Karachi in Pakistan is 455 nm, and Mumbai in India is 843 nm. Pakistan's Chinese-funded deep sea port at Gwadar is also on the Makran coast, at a distance of mere 72 km. A former port named Tis in Chabahar's neighborhood dates back to 2500 BC, known in Alexander the Great's conquests as Tiz, eventually renamed Tis. Modern Chabahar dates back to around 1970, when it was declared a municipality and large port projects were started by order of Mohammad Reza Pahlavi, the Shah of Iran. In Sept. 2013, the earthquake in Pakistan affected Gwadar port situate in strategic Strait of Hormuz, located at the apex of the Arabian Sea and at the mouth of the Persian Gulf. During the last century Gawadar was under Omani rule ~ Pakistan purchased the Gwadar enclave from Oman for $3 million in Sept. 1958. The strategically-located Chabahar port allows New Delhi to easily access Afghanistan and Europe by circumventing Pakistan. The development of the port in southern Iran is a tactical decision as it will counter China’s growing involvement in the region. Chabahar port lies outside the Persian Gulf and is easily accessed from India’s western coast, without entering Pakistan. The agreements come months after the lifting of international sanctions on Iran, following Tehran’s historic nuclear deal with the Western powers over its contentious atomic programme. Modi also called on Iranian Supreme Leader Ali Khamenei, signifying the strength of the unique relationship between the two countries. Invoking the age-old cultural bonds between India and Iran, Modi said it was time for the two countries to march together by regaining the past glory of historical ties which had witnessed its share of ups and downs. India has promised to invest billions of dollars in setting up industries - ranging from aluminum smelter to urea plants - in Iran's Chabahar free trade zone after it signed a pact to operate a strategic port on the Persian Gulf nation’s southern coast. Shipping Minister Mr Gadgari said - "The distance between Kandla and the Chabahar port is less than the distance between New Delhi and Mumbai, and so what this agreement does is to enable us quick movement of goods first to Iran and then to Afghanistan and Russia through a new rail and road link." Gadkari said India Ports Global Pvt, a joint venture of the Jawaharlal Nehru Port Trust and the Kandla Port Trust, will invest $85 million in developing two container berths with a length of 640 metres and three multi-cargo berths. The Indian consortium has signed the port pact with Aria Banader Iranian. 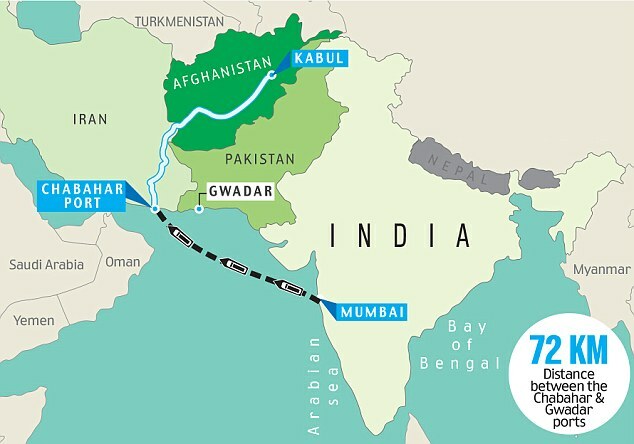 As a repercussion of the news, the Dawn of Pakistan reports : Two former defence secretaries insist the trade route which is being established by Iran, India and Afghanistan, linking Chabahar Port with Afghanistan, is a security threat. The comments made by the former defence secretaries just a week after the agreement for the trade route was signed by Iranian, Afghan and Indian leaders, is a reflection of the opinion held in military circles, which have been deeply suspicious of the port and the trade route. With regards – S. Sampathkumar 1st June 2o16.